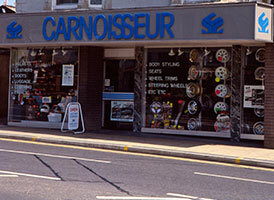 The Carnoisseur brand was established in 1979. We started off manufacturing and selling sisal mats for BMWs, Golf GTIs, Porsche 911s, etc. It soon became apparent that we wanted to broaden the range of products we offered and in 1982 we published the first Carnoisseur catalogue. The Carnoisseur catalogue was a mail order catalogue; the first of it's kind in the UK. Popular products from the time included Corbeau Seats, Richard Grant Bodystyling, Autoplas Rear Visors and Karobes Seat Covers. Some of these products are still in our range today! We've taken the time to scan in some of our favourite catalogues from over the years, you can click here to have a look. We hope it brings back some fond memories for you - it certainly does for us! The business continued to grow and in 1986 we opened our first shop. We have had shops thoughout the UK, and thanks to the efforts of these local shops our brand became well known in the market place. However times changed and the advent of the internet meant that we had to as well. We now provide products direct to you, the customer, through our website and through our Partners. Our Partners are no longer standalone Carnoisseur "shops", instead they are businesses that can offer our full product range and they have the facilities to offer local customers a fitting service for these products. We have now been selling alloy wheels, performance parts and specialist car accessories for over 40 years. We are a family business that pride ourselves on offering our customers a personal service. Our customers are car enthusiasts just like us; they want quality products that fit their requirements and we are here to make sure that happens. If you have any questions about our services or product range, please don’t hesitate to contact us. Next Page - Click here to view our History page.